If you choose a garden room specification that is Building Regulation compliant (not all designs are) you can use the room as an extra bedroom. 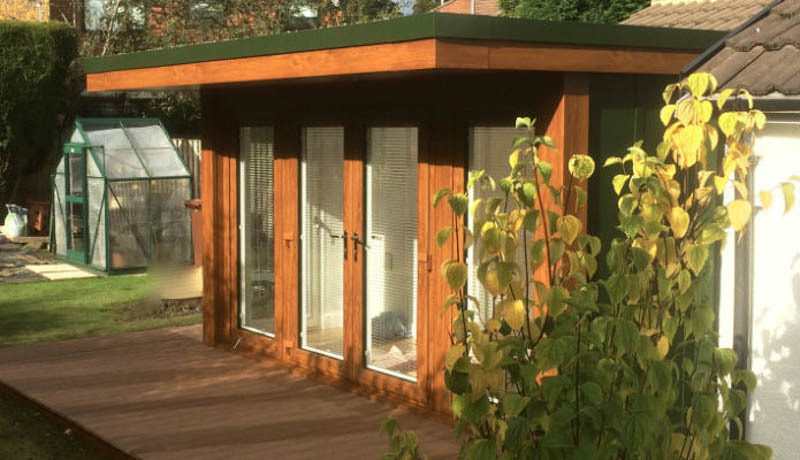 A recent Booths Garden Studios customer designed his garden room so that it could double up as a guest room. John, Booths Garden Studios client, ordered a 3640mm x 2730mm garden room, and with a long term view of it being used for guests had a toilet cubical installed. This decision means he can easily accommodate two guests in his garden room and they are not reliant on the facilities in the house. Booths Garden Studios offer the option of a cartridge toilet system. This system removes the need for the extensive groundworks which are needed to connect a conventional toilet system to the mains water and sewerage supplies. These connections are both time consuming and expensive, so by opting for the cartridge toilet system John has the convenience of an ensuite garden room but at a fraction of the cost of other options. The front elevation is fully glazed with a mix of French doors and floor to ceiling windows. This glazing wraps around onto the left-hand elevation. John chose to have Booths flyover roofline; this means the roof extends beyond the front elevation by 910mm creating a canopy which creates a covered area outside the garden room. He extended this outside space with an 1820mm deck area which wraps around the left-hand side of the building. John chose an air conditioning system, meaning that he will have total control over the temperature in the room all year round. As you can see in the image below this sits discreetly on the internal wall. A second unit is positioned outside the buildings. John personalised the building with several other options, such as downlights in the flyover roof, an exterior power socket and recessed blinds in the windows and doors. This garden room that can double up as an extra bedroom cost in the region of £24,000 which is very reasonable for the flexibility it will add to family life. To learn more about creating an extra bedroom in the garden talk to Booths Garden Studios on 07590 067 120 or visit their website to explore their work further.